The lady on the till was so lovely & helpful. She kept my little girl entertained while I was trying shoes on my son. Nothing was to much bother for her & she made a stressful shopping trip a lot easier. Her customer service was excellent. Definitely be back in the abbeycenter store again, such good value for money & choice. Everything was laid out well in store, it was extremely well presented and tidy. However I felt that the service I received on the till could have been better. Samantha wasn't very approachable or smiley, I didn't feel she give me the customer service I should of got. I was impressed with the product and price though I felt the service on the till could have been better. I am leaving a comment not about the visit on the receipt but about a return visit I had when the shoes fell apart a few weeks later. 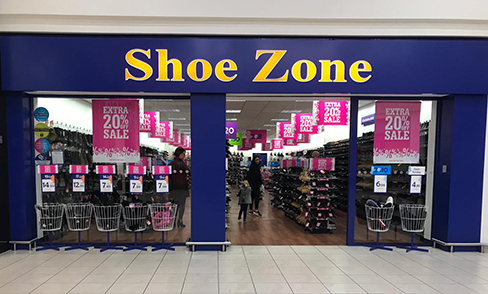 My son needed new school shoes and with only 6 weeks remaining of the term I bought him a pair of shoes from this store on 16/5/16. By the end of the following week the heels were starting to come apart and on 9/6/16 practically the whole sole came away from the shoes and he is not able to wear them. I took them back to the store with the receipt and was told that as the manager was on holiday they could not change them as it was wear and tear. The only option I had was to buy him new shoes and come back in again when the manager was back and there was no guarantee that my money would be refunded. As he needs shoes for school tomorrow I have had not other option than to buy them elsewhere. I shall not be looking into customers rights for faulty goods.